2/28 offers a very stylish and muscular package. His pedigree carries some of the most popular, proven genetics of several generations. On his sire side, he goes back to Wards Bravo 1/09 and Warrior 666, an international champion. His dam is VL Elena 107/0, a very feminine and fertile cow. His calves are thick, deep in their quarters, stylish, and loaded with eye appeal. 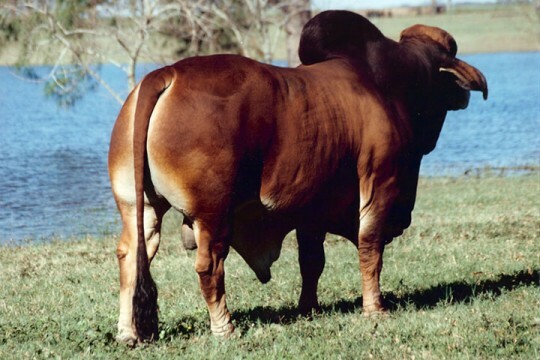 VL 2/28 has everything that will make the outcross sire for the red Brahman world. He has a great birth weight of 78 pounds, followed by a 575 pound weaning weight and 895 pound yearling weight. As a mature bull he stands 63.5 inches and weighs 2,350 pounds. We think 2/28 works best on large-framed cows with clean underlines. 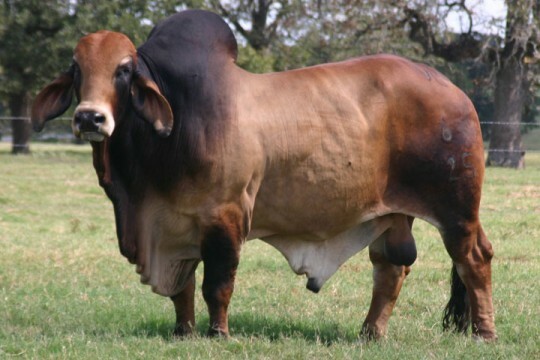 He produces medium frame cattle with large muscle, as well as strong top lines. His offspring are easy fleshing and he will sire calves sure to add to a commercial program’s bottom line.